Now, since Torah and its commandments clothe all ten faculties of the soul, and all of the soul's 613 `organs', from head to foot, [i.e, from its highest level - its `head' - to its lowest level], it [the soul] is truly completely bound up with G-d in the (12) `bond of life,' and the very light of G-d envelops and clothes it from head to foot. So it is written: (13) `G-d is my Rock, in whom I take refuge' [and naturally, only that which surrounds a person can protect him]; and it is further written, (14) `As with a shield G-d's Will surrounds him, meaning His Will and wisdom that are clothed in Torah and its commandments. For [the reward] in the World to Come consists of enjoying the radiance of the Divine Presence; (16) it is the pleasure derived from comprehension [of G-dliness]. For, although the Torah has been clothed in lowly material things, [and it is only these material things that man's intellect grasps when studying Torah, not the essence of G-d's Will and wisdom, yet] - it is, by way of illustration, like one who embraces a king. There is no difference in the degree of his closeness and attachment to the king whether he embraces him when the king is wearing one robe or many robes, since the king's body is in them. [Similarly, when a Jew `embraces' G-d's wisdom in Torah study, the fact that His wisdom is clothed in material `robes' is irrelevant. Similarly, when the king embraces one with his arm, though it be dressed in his robes. [To illustrate that Torah is analogous to a royal embrace, the Alter Rebbe quotes]: As it is written, (17) `His [G-d's] right hand embraces me, which refers to Torah, called `the right hand' because Torah was given by G-d's (18) `right hand,' for [Torah] is related to the attribute of Chesed [`kindness', and `water'. As explained in the Kabbalah, the right hand represents both Chesed and water (and, as said earlier, Torah is compared to water), and the left hand represents Gevurah (`severity') and fire. When the verse states that G-d's right hand `embraces me, the intention is that G-d `embraces' and envelops the soul through Torah - G-d's `right hand. Thus, the bond that Torah study creates between the soul and G-d is two-fold: The soul `embraces' G-d and is `embraced' by G-d. In this, Torah study is superior to other mitzvot, as discussed in the following chapter. -Leviticus 27:28 "No taboo thing...shall be redeemed"
to his ownership (see above: Negative Mitzvah 110). depending on the type of Cherem. object that was designated as Cherem without any defined purpose. and poured them into a bowl. hands and hurried to the door. on the chair and continued to add spices to the cake mixture. so do I! It's nice now." mix certain types of seeds together when planting our crops. -Leviticus: "You shall not sow your field with mingled seeds"
In commemorartion of the miracle of Chanukah (see "Today in Jewish History [http://www.chabad.org/225034]" for Kislev 25) we kindle the Chanukah lights -- oli lamps or candles -- each evening of the eight-day festival, increasing the number of lights each evening. For tonight, we kindle six lights. (In the Jewish calendar, the day begins at nightfall; this evening, then, commences the 6th day of Chanukah). Two years after his arrest and liberation in 1798 (see entries for "Kislev 19 [http://www.chabad.org/150146]" and here [http://www.chabad.org/63817]), Rabbi Schneur Zalman of Liadi (founder of Chabad, 1745-1812) was arrested a second time; again, the charges were that his teachings undermined the imperial authority of the Czar. His second incarceration was less severe than the first; yet Chassidim mark the anniversary of his release on the fifth day of Chanukah with farbrengens (Chassidic gatherings) and the study of his teachings. Once, when Rabbi DovBer of Lubavitch, the son of Rabbi Schneur Zalman of Liadi, was a young man, he was visiting with his father-in-law in Yanovitch. There he met with one of his father's chassidim. The chassid noticed that the young 'rebbe's son' was all too aware of his achievements in scholarship and meditative prayer and felt that some cutting down to size was in order. Said the chassid to Rabbi DovBer: "Considering who you are and how you've lived, what's the big deal? Your father - well, we all know who your father is. You were certainly conceived under the holiest of circumstances, and I'm sure that your father secured a most lofty soul to bring down into the world. Then you were raised in a rebbe's home and great care was taken to mold your character and safeguard you from any negative influences. All your life you've been exposed to scholarship and sanctity and to this very day you're preoccupied only with the study of Torah and the teachings of chassidism. So you've amassed a certain amount of knowledge and you pray with fervor and devotion. Big deal. "Now, take me for example. My father was a simple man, and we can well imagine what was on his mind when he scraped out some dreg of a soul out the bottom of the barrel. My upbringing? I was raised as a goat and basically left to my own devices. And do you know what I do with my life? Let me tell you how I earn my living. I loan money to the peasants during the planting season and then, during the winter months, I make my rounds of their villages and farms to collect the debts before they have a chance to squander their entire harvest on vodka. This means setting out several hours before sunrise, well before the permissible time for prayer, equipped with a flask - for without a drink one cannot begin to talk business with a peasant. After drinking to his health, one must share a 'l'chayim' with the woman in the house as well - otherwise she can ruin the whole deal for you. Only then can you sit down to settle part of the account. The words of this chassid, who was, in truth, renowned for his refined nature and soulful prayers, made a deep impression on Rabbi DovBer. The young man immediately travelled home to his father and poured out his heart. He bewailed his spiritual state, saying that his service of G-d is worthless, falling so short of what is expected from him. The next time the chassid from Yanovitch came to Rabbi Schneur Zalman, the Rebbe said to him: "I am most grateful to you - you have made a chassid out of my Berel." There is a little secret about the life of the Jewish people through the ages. Don't let it out, keep it quiet. I will just whisper it to you: sometimes, other nations or political forces, or even cultural ideologies have tried to dominate us, control us, or worse. And what happened? Despite tragic losses, we have survived, thank G-d. In fact, in a paradoxical way, we have sometimes grown from the experience. It led us to as deeper appreciation of who we are. Deep down, every Jewish man and woman is utterly dedicated to G-d. He or she may not seem to be dedicated to anything spiritual. The dominant focus in life might sometimes seem to be the opposite. Yet, deep down, the Jew is dedicated to Judaism, and to the Divine reality which Jewish teachings reveal. Chanukah is a prime example of such an experience. Chanukah is a festival relating to a time when the Jewish people reached a very low point. We were in the Syrian-Greek Empire, and among the Jewish people there was widespread assimilation to Greek values. Many of the leading personalities in Jerusalem and elsewhere had adopted Greek names and the Greek form of idol worship. At the final stage of this process, the Syrian-Greek King Antiochus banned Judaism entirely. However, we rallied from this point of darkness, inspired by the small and totally dedicated group of Maccabees. We fought physically against the Syrian-Greek oppressors, and we also battled spiritually to regain our unique Jewish ethos. The Chanukah festival commemorates both victories. In the morning prayers every day of Chanukah, including this Shabbat, we sing Hallel, thanking G-d for the military victory. In addition each evening we light the Chanukah lights, commemorating the miracle of the oil which signified a Divine response to our spiritual struggle and victory. The Chanukah events in ancient Israel signify the way we reached into our innermost depths, to the very essence of the Jewish soul. We were not simply brave men and women; we were spiritually inspired and were able to reach to the Divine. This inner spiritual victory was expressed in the miracle of the oil in the Golden Menorah in the Temple: the oil sufficient only for one day, burnt for eight days. This explains an interesting point about the way we celebrate the Chanukah festival. Yes, of course, we light a Chanukah lamp, each evening adding another candle till on the last night - Sunday January 1st this year - we kindle eight lights. 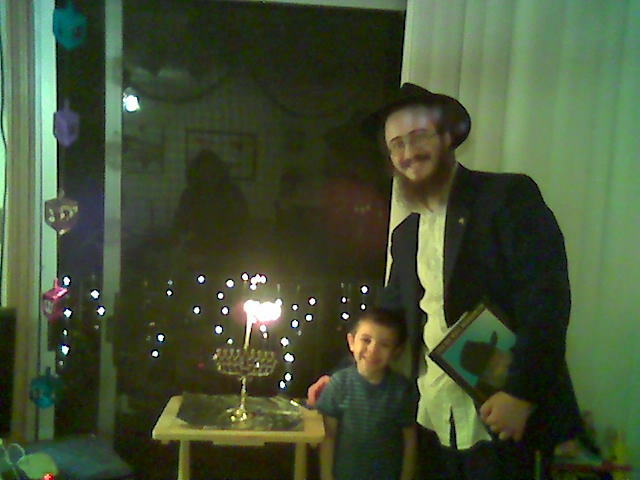 The Talmud tells us that there are different ways of lighting the Chanukah lights. One way is "standard", lighting one candle per household each night. A second way is "mehadrin", more careful and pious, in which each person in the household lights their own candle each night. The third way is "mehadrin of the mehadrin", the pious of the pious. The Talmud then describes precisely the way that we light the Chanukah lamp today. This deepest level is the standard for the entire Jewish people . We might not think of ourselves as falling into that category, of being the "pious of the pious". Yet, all over the world, in all branches of Jewish practice, that is how we light the Chanukah lamp: as the mehdarin of the mehadrin, the most dedicated and the most concerned. Because Chanukah taught us who we are, deep down: utterly dedicated to G-d .
2. Based freely on the Lubavitcher Rebbe's Likkutei Sichot vol.25, pp.249-250. In the world at large, there are many opinions regarding the narratives of the Torah. Some maintain that all the stories should be understood as symbolism and allegory. Their intent, they say, is to teach us lessons in Divine service, not to chronicle history. The traditional view holds that every narrative in the Torah must be considered a record of events which actually transpired. Chassidic thought takes a third approach. To quote a kabbalistic expression: The Torah speaks about the upper realms, and alludes to the lower realms. This means that the narratives of the Torah are descriptions of the interrelation between Divine attributes in the spiritual realms. Nevertheless, since material existence is an outgrowth of spiritual existence, whatever happens in the spiritual realms is reflected in this world. Thus, every narrative in the Torah is a record of an actual event, but that event represents far more than what transpires in the material world. It is a dynamic movement beginning within the sublime spiritual planes and having ramifications on all levels of existence. This approach expresses the positive dimensions of both the views mentioned. On one hand, the historical integrity of the Torah is preserved. Conversely, the relevance of the Torah is not as a book of records, but as a guide, reflecting spiritual truths that should be applied in our Divine service. (yosef) to me another son (ben acher), reflects the spiritual mission of the Jewish people. Entities which have hitherto been acher (other  estranged from their G-dly core)  are brought close and manifest the intimacy of ben (a son). The prison in which Yosef is held refers to the body, and to material existence as a whole. These tend to confine the infinite power of the soul and deny it expression. Although G-d gave man His Torah, His will and wisdom, the Torah is also affected by the limits of material existence, and its G-dly source is not always evident. These concepts are alluded to in the opening phrase of this weeks reading: Vayehi mikeitz shenasayim yamim, - And it came to pass at the end of two years. Two years refers to the Torah, which contains two elements, the Written Law and the Oral Law. As the Torah exists within the confines of material existence, its power appears to have a ketz, an end and a limit. Nevertheless, because Yosef  in analogy, the Jewish people  is essentially unlimited, the ketz, the restrictions of worldly existence, ultimately become vayehi, a thing of the past. Yosef leaves prison and becomes the ruler of Egypt. In the analog: a Jew is sent into this world to reveal G-dliness. This is the purpose of his being, and eventually this purpose will be achieved. The material nature of worldly existence may initially restrict the expression of a Jews true nature, but the constraints will be temporary. Ultimately, just as Yosef became the ruler of Egypt, every Jew will become a source of influence and power, showing how infinite G-dliness can permeate finite material existence. To apply these concepts to our Torah reading: the question is whether Mikeitz refers to the end  the final two years  of the trials and tribulations Yosef suffered in Egypt, or to the beginning  the two years leading to his assumption of power. According to the first interpretation, Mikeitz refers to the most difficult challenges Yosef faced in Egypt, for it is before daybreak that the darkness becomes most powerful. According to the second interpretation, mikeitz refers to the dawning of Yosefs redemption. There is a connection between the two. Hidden within the challenges of ketz dismola  the last moments of exile  are G-dly sparks. Confronting these challenges taps these G-dly energies and brings ketz hayamin, the beginning of the Redemption. The entire Jewish people are at times referred to by the name Yosef. May the transition experienced by Yosef become manifest for our people as a whole. For we too have confronted the hardships of exile and are awaiting the revelation of ketz hayamin, the first rays of the Redemption. May this take place in the immediate future. Dedicated by Mr. & Mrs. Moshe Glick in honor of the birthdays of Calev and Hillel. It was the fourth night of Chanukah, and the Cohen family was sitting around the living room watching the Chanukah lights. With them was the grandfather of the family. That evening he had come to their home to light the Menorah with them, and now he was telling his grandson interesting things about Chanukah. "Grandfather" Ben said, "Can I ask you a question?" His school teacher had given out a list of questions, so now was a good time to find one of the answers. "That's a good question, Benjamin", his grandfather said. Just then there was a "click" and all the lights went off in the house. A power cut! The beautiful Chanukah lights shone brightly. Then the electric lights came on again. "There!" said Ben's grandfather. "That helps us understand the answer to your question. In the times of the Temple there were miracles on a daily basis, people could see the existence of G-d in a clearer way, there was the Temple and there was a High Priest, and every day he would light the Menorah which would give spiritual light for the whole world. So at that time the Menorah in the Temple had seven branches, like the seven days of the week, something natural and normal, and it was lit during the day." "But what about Antiochus and the Chanukah story?" Ben asked. "Wasn't there a time when the Jews were being oppressed and they couldn't go into the Temple?" "Exactly!" said his grandfather. "It was like a power-cut. It was a time of darkness. Then the dedication of the Jewish people showed itself. They were determined to keep Judaism and they overturned Antiochus. We remember that now by lighting a Menorah with eight lights, higher than seven. Something more than nature." "Like Brit Milah on the eighth day?" asked Ben. "Like the Chanukah Menorah shining during the power cut, said Ben. The image of the dark room and the shining candle-flames came back to him. The lights of dedication to G-d and to Judaism, which would always shine brightly. In the Torah portion of Mikeitz we read that during the time of famine in Canaan, "Yaakov saw that there were provisions in Egypt. Yaakov said to his children: 'Why are you showing off?' " Rashi explains that this means, " 'Why are you showing off before the children of Yishmael and Esav, as if you are satiated?' For at that time they still had food." There are a number of questions regarding Rashi's comment: Why does he state "Why are you showing off before the children of Yishmael and Esav" who did not live in Canaan, rather than state the obvious - "Why are you showing off before your Canaanite neighbors"? Additionally, Rashi seems to contradict himself. He begins by stating: "Why are you showing off ... as if you are satiated," implying that in reality they were not satiated. He then concludes by saying: "For at that time they still had food," thus giving us to understand that they were not hungry. We must perforce say that Rashi is explaining that Yaakov's children behaved as if they had a lot of food when in reality they had only enough for "that time," i.e., to last them a short while. Still, the question remains: Why would Yaakov's children pretend they had more provisions than they actually had? In the simple context of the verse, Yaakov was not afraid of arousing the jealousy of their neighbors, for they only had enough to last a short while. Rather, he objected to the fact that they showed off as if they had no worries about food - something likely to offend the descendants of Yishmael and Esav, as shall presently be explained. As indicated earlier in the book of Bereishis, hunger in Canaan was not uncommon; there was famine there both in the times of Avraham and Yitzchak, causing them both to leave the land. The reason they had to depart was not because they were undeserving of G-d's support during a famine. For we find that when Yitzchak was in Grar he was tremendously successful, notwithstanding the fact that it was "a year of famine... a difficult land and a difficult year." Yaakov's children were strong in their faith that G-d would not forsake their father or themselves. When they saw that they still had food while all the inhabitants of Canaan were hungry, they were sure that they merited Divine blessings and success. Thus, although they only had enough food to last a short time they were sure that G-d would continue to provide for them in a miraculous manner, similar to His general conduct with the Patriarchs. They therefore behaved as if they had a lot of food, for their faith in G-d let them act as if the food they would need in the future was already in hand. It was with regard to this manner of conduct that Yaakov commented: "Why are you showing off before the children of Yishmael and Esav?" This manner of conduct - demonstrating complete confidence of obtaining the necessary provisions in Canaan without having to go to Egypt - could arouse the ire of the children of Yishmael and Esav, the descendants of Abraham and Yitzchak. The children of Yishmael and Esav might well think to themselves: How is it that Yaakov's children are sitting so pretty in the land of Canaan during these years of hunger? Are they better than our ancestors Avraham and Yitzchak, who had to leave the land because of hunger? This kind of thinking, however, meant that the children of Yishmael and Esav failed to understand the true reason that Avraham and Yitzchak left the land - a reason that did not necessarily apply to Yaakov and his children. These things people call amazing coincidences, synchronicity, small miracles -- this is the way the world is supposed to work. It is only that the world is in slumber, like a sleeping person who does not see, does not hear, does not speak -- so that nothing distinguishes his head from his feet, his heart from his brain. So too, the world lies deep in a dream where anything is possible, but nothing seems to have a goal. Where only chaos reigns. It takes only one person to open his eyes, his ears, his mind and his heart and the objects of this world fall into place and work together as a single whole. Synchronized. As they were meant to be. A Palestinian terrorist, prevented from crossing the Green Line, blew himself up near a group of Israelis and Arabs near Tul Karem. One Israeli and three Arabs are dead, nine people were wounded. The attack occurred shortly before 10 AM. Warnings of a possible terrorist attack planned for a densely-populated area in Israel had been received - as has been the case in many areas over the past weeks. At one of the impromptu checkpoints set up in the area as a result, soldiers stopped a suspicious-looking car and began to check the occupants. At one point, one of the passengers got out and, realizing he would not be allowed to proceed to his destination in an Israeli population center, detonated the explosives he was wearing under his clothing. The IDF officer who tried to check the terrorist was killed, and three soldiers were wounded - one of them in serious condition. Two of the wounded were evacuated to Meir Hospital in Kfar Saba, and another one was flown to Hillel Yaffe Hospital in Hadera. In addition to the three Arabs who were reported killed, six more were lightly wounded. The name of the killed officer was publicized after his family was notified: Lt. Uri Binamo, 21, of Kibbutz Nesher. "I am so proud of that boy," his father told Ynet. "We have lost a boy who gave his soul to the country... He would often visit his soldiers, to make sure they didn't have problems at home, rather than come home himself." Uri is survived by his parents and three younger sisters. He will be buried in the Haifa Military Cemetery Friday morning. It had originally been thought that two terrorists blew themselves up, but it then became clear that a woman standing nearby was not involved in the attack. MKs Uri Ariel (National Union) and Ehud Yatom (Likud) said that the current increase in terrorism is fueled by the government's soft response to Kassam attacks from Gaza and other terrorist activities. A soldier was stabbed this afternoon in his neck at the Atarot industrial zone north of Jerusalem, and is listed in moderate condition. Another attempted stabbing nearby, at the Kalandia checkpoint in the same area, was thwarted last night. Earlier this month, Border Guard Sgt. Nir Kahane was stabbed to death at that checkpoint. Today's attack brings the total number of terrorist casualties this month to eight. Kadima, sometimes known as the Ariel Sharon party, publicized its platform at a Knesset faction meeting Wednesday. Sharon favors more withdrawals, but the platform doesn't specify from where. The platform states that Jerusalem will remain under Israeli sovereignty, indicates that Israel will withdraw from large areas of Judea and Samaria, and does not mention the all-important Jordan Valley at all. The party's Platform Committee Chairperson, Justice Minister Tzippy Livny, acknowledged the lack of detail, saying that in general, "Israel blabbers itself to death." She has said in the past that there is no point in elaborating on issues that must be settled in negotiations between Israel and the Palestinian Authority. The Jordan Valley represents a buffer zone between the rest of Israel and Jordan, Iraq and much of the Arab world. The platform follows Ariel Sharon's line in stating that unspecified "large settlement blocs" - usually understood to mean only Maaleh Adumim, parts of Gush Etzion, and Ariel - will remain Israeli. The remaining areas of Judea and Samaria are understood to be dispensable. As Ariel Sharon was the first Israeli prime minister to agree to the establishment of a Palestinian state, the platform unsurprisingly also features this concept prominently. Such a state, according to Kadima, would also serve as the solution for the so-called refugee problem. The Arabs claim that the establishment of the State of Israel in 1948 led to the creation of "millions" of Arab refugees who deserve to return to their homes in Israel. The Kadima platform states that once a PA state is formed, the refugees will become the problem of this new entity. "Israel's consent to a Palestinian state is contingent upon it being the absolute national solution for all Palestinians, including the refugees," Livny said. "No refugees will be allowed to enter Israel, under any agreement." The Likud, currently running a close third in the polls behind Labor, has not yet finalized its platform. Party leader Binyamin Netanyahu has appointed a platform committee comprising Foreign Minister Silvan Shalom, Health Minister Danny Naveh, faction whip MK Gideon Sa'ar and MKs Yuval Shteinitz and Uzi Landau. One of Ariel Sharon's problems seems to be how to go about filling the long list of MKs he must appoint in the coming weeks. Newest member Shai Hermesh says Sharon doesn't have too much power. The party has attracted several leading political names since its inception in mid-November. However, even with those who left the Likud to join Kadima, there are not nearly enough famous names to fill out the nearly 40 Knesset seats the party appears headed to win. Sharon himself is to appoint the party's list of Knesset candidates, giving him the unprecedented power of exclusively naming a significant portion of the Israeli legislature. In addition, Sharon is not bound by party organs - which do not yet exist in the fledgling party - and his control over his appointees in the future is expected to be very great. A total of 20 MKs, including Sharon himself, are now members of Kadima. These include 15 who left the Likud, as well as Shimon Peres, Chaim Ramon, and Dalia Itzik of Labor, David Tal (One Nation), and Michael Nudelman (National Union). Others who have joined Kadima include Defense Minister Sha'ul Mofaz, former GSS head Avi Dichter, former Shinui party bigwig Prof. Uriel Reichman, former Education Ministry Director-General Ronit Tirosh, and Kiryat Shmonah Mayor Chaim Barbivai. The latest to do so is Jewish Agency treasurer Shai Hermesh [pictured above], who announced his decision yesterday. Labor Party members fear that with his departure, he will take many Labor supporters with him to Kadima. A7: "What made you leave Labor and join Kadima?" Hermesh: "It's very simple: Ever since Sharon announced the Disengagement Plan two years ago in Herzliya, the political structure in Israel has changed greatly. Once the Likud accepted the idea of a small state with a Jewish majority, as opposed to 'two banks to the Jordan' ... there's no longer a gap between my conception and Sharon's. The question for me therefore became, 'Who would be able to garner the most support and succeed in this goal?' It was clear that the answer was Sharon." A7: "Do you not feel that Sharon has too much power? He will no longer face a hostile Central Committee, nor a group of 'rebel' MKs like in the Likud, but rather dozens of MKs that he himself has appointed." Hermesh: "I have seen him with too little power... just weeks ago he was humiliated by his own party, and it became too much for him, so he left and started his own party." A7: "When you met with Sharon, how did it work? You said, 'I've decided to become a Knesset Member, so here I am,' and then he said OK and told you what number you would be?" Hermesh: "Not at all... I know him for a very long time, and I told him I want to join forces with him, that I have no demands, and I want to help him, and asked what he would like me to do... He then invited me to come with him to the Kadima Knesset faction meeting... It was not said at all that I would be an MK, but I had a feeling that I wasn't being asked to attend the faction meeting as his bodyguard..."
A7: "You don't feel that it's undemocratic for one person to single-handedly appoint 40 MKs?" Hermesh: "It's true that he's like Raful [the late Tzomet Party head Rafael Eitan] and Tommy Lapid [head of Shinui], and it's true that there are no organs, but that is the situation at present, and in the future we will form party organs..."
A7: "Is this a democratic arrangement?" Hermesh: "You'll have to ask the voters. Apparently they have decided that they want something different..."
A7: "Have they decided that they want a one-man rule?" Hermesh: "There is still a democracy here - "
A7: "There have been other dictatorial regimes in history that have been voted into power democratically." Hermesh: "I would advise you not to compare Israel to Germany, or Sharon to Hitler..."
A7: "Let's say it happens a year from now that you and several other party MKs disagree with Sharon on something, will your voice be heard?" Hermesh: "Those who know me know that when I disagree with something, I'm not bashful about it." The operation is aimed at ending rocket attacks on western Negev communities and the Ashkelon industrial area, including the strategic power plant. Towns such as Sderot, though, remain exposed to rocket attacks. Northern Gaza residents were warned in leaflets dropped by IDF planes earlier in the day not to enter the zone, beginning after 6:00 PM Wednesday. Those who disregard the warning, risk to their lives, the leaflets warned. Arab residents told Israel Radio, however, that they have no intention of leaving their homes. A Kassam rocket launched from Beit Hanoun landed just south of Sderot a few hours before the security zone went into effect. No injuries or damage were reported. Arutz-7 military correspondent Haggai Huberman reports that the security zone consists of the destroyed communities of Elei Sinai, Dugit and Nissanit, whereas the populated area of Beit Hanoun is being left alone, even though it is the source of the majority of Kassam fire. "While Ashkelon is being protected, the lives of those living in Beit Hanoun are still being valued above those of the Jews living in Sderot," Huberman said. Shortly after the security zone went into effect, an Arab man trying to fire a Kassam rocket with two accomplices was wounded when he entered the zone, defying the IDF ban. Meanwhile, a new armor that will protect roofs against Kassam rockets has been approved for use in buildings located within the ever-growing range of Kassam rockets, according to the Globes business news website. Israel Military Industries Ltd. CEO Avi Felder said the armor is inexpensive but very effective for all types of roofs. IMI was chosen by the IDF Home Front Command to develop the technology. "The next expulsion is not far off," warned former Foreign and Defense Minister Moshe Arens warned at a meeting of local Yesha representatives held in Beit El earlier this week. "It appears that nothing will prevent Arik Sharon from continuing and implementing further disengagements," Arens said. "Let's not fool ourselves as to his intentions. Sharon himself doesn't believe that agreements with the PA will work, and there's no doubt that he will once again consider unilateral measures." Prof. Arens served as Defense Minister in four different Israeli governments and Foreign Minister in one. Disengagement prisoner Eli Herbst and MK Uri Ariel were also in attendance at the Beit El meeting. Representatives of Shilo, Adam, Migron, Beit El, Psagot, Kokhav Yaakov, Rimonim, Ofrah, Tel Tzion, Psagot, Amonah, Eli, and Michash took part as well. Arutz-7's Shimon Cohen reports that MK Uri Ariel (National Union), who served as Mayor of Beit El before entering the Knesset in 2001, told the concerned audience, "The current political reality is a danger - and there are those who have not yet internalized this. Not one community throughout Judea and Samaria has an insurance policy." The proof, MK Ariel said, is the area of northern Gaza: "The three communities there - Dugit, Nisanit and Elei Sinai - were destroyed [in the disengagement] with no logic whatsoever. Even [former Shabak head] Ami Ayalon said he didn't understand why they were taken down. It was an area without Arabs, close to the Green Line, with a fence, and with state-owned lands. There was no logic to the uprooting there." Prof. Arens said that the withdrawal from Gaza was a "Supreme Court-approved strike against civil rights... proving that whoever lives in Judea and Samaria has fewer rights than one who lives in Haifa and Tel Aviv." Sharon thus broke a taboo, Arens explained, "proving that he can do something that even the left-wing thought was impossible. It aroused the appetite of the Americans and the PA, and part of the Israeli public as well, for more uprootings." The disengagement was "a Sharon initiative, and was not forced upon Israel by the Americans," said Arens, who served as Israel's Ambassador in the U.S. in 1982-3. It wasn't thanks to Sharon that the expulsion went over without violence, Arens said, "as the media portrayed it, but rather due to the special nature and patriotism of the residents themselves." MK Ariel said there is no point in waiting any longer to start the campaign for Yesha: "We must initiate, and not be dragged along by events. The chances of winning are much greater when we initiate. It won't help if we wait for the army to stand outside our gates with the expulsion orders... We must begin immediately with public relations - but unfortunately, we're not doing it. Even to sell bananas you need PR today. We have to understand that this requires investment of resources, and it must be done professionally." "We must have those who make the decisions come here and see for themselves," Ariel said. "There are some 500 people who are influential and who make the decisions. They have to be brought here. It's not easy; there's not much time. We also have to bring thousands of other Jews from all over the country, as we did in the We're on the Map campaign. We need not work on the leftists, but first on those who are closer to us in ideology." YeshaHomestead is a movement that promotes Jewish settlement and purchase of land as a possible solution. "Sharon forcibly expelled 10,000 Jews from Gaza and dumped them in hotels," the movement asserts, adding, "Next, they intend to 'inconvenience' only 20,000 Jews by forcibly evacuating them. Only by having another several hundred thousand Jews move to the areas slated for the next expulsion of the Jews can this roadmap be stopped. We need a roadblock." The commandment to publicize the Chanukah miracles is central to the holiday celebrations. In Israel, it works both ways: Publicizing Chanukah - and Chanukah-izing publicity. A radio commercial on Voice of Israel Radio begins with an obviously freezing man singing in a shivering voice the famous Chanukah hymn, "Maoz Tzur" - at which point the narrator interrupts and asks, "Cold in your feet? Try buying a Carmel carpet!" The next commercial, coincidentally, features another man trying to sing the same song but stumbling over the words - and yet another narrator interrupts and says, "Can't see? Go to Opticana for new glasses!" Thus is Chanukah enlisted in modern Israeli ad campaigns to sell various goods. Those who came up with the campaigns, however, might not have been aware that Chanukah itself is the very epitome of a public-relations campaign, instituted by the Sages. Candles are lit each night of the eight-day holiday for one reason: pirsumei nisa - to publicize the miracles. 1. What is to be advertised? The Sages of that generation [some 150 years before the Common Era] instituted eight days of joy and praise to G-d, featuring nightly candle-lighting, to publicize and glorify the miracles of the victory over the Greeks and that of a Holy Temple flask of oil lasting for eight days. 2. What is the target audience? Jewish Law states that everyone is obligated in the commandment, even children who are barely of school age, and even one who is blind and cannot see the candles. 3. What is the main message or slogan? The Sages emphasized the beneficent and miraculous nature of G-d's intervention, while minimizing human courage and prowess. Matathias and his son Judah led the military fight against the Greeks, but it was mainly their spiritual courage in refusing to give in to the Greeks' religious oppression that is lauded. 4. How to achieve maximum exposure and high ratings: The Sages instituted the candle-lighting at a time and place that would be seen by the maximum number of people: not before sundown, and not after people have left the streets; neither below or above a certain height; ideally, outside the front entrance to one's home; and not in a place where one normally lights candles, so that it will be clearly noticeable that these lights are for Chanukah. A major publicizer of websites publicizing a wide variety of information on the Chanukah holiday is Jacob Richman's list of Chanukah websites. They were stripped of their jobs, their ranks and their source of income, but expulsion objectors from the IDF and police don't regret their decision to stand up for what was right. They have harsh words for their fellow "kippa-wearers" who took part in the implementation of the expulsion, and say they will only wear the olive-green uniforms of the Israeli army once it returns to the IDF it once was. Elazar Sandorfi, Dmitri Pechnikov, Avidan Weitzman, Moshe Gonen and Shaya Leib Gilo spoke with Hagit Rotenberg of the B'Sheva weekly, describing their ordeals. The lengthy trials and jail-time they have faced does not make them flinch from their belief that they did the right thing from an ethical and Jewish legal perspective. "He was surprised and I tried to explain it to him in understandable terms: 'I am not able to get up in the morning, to put on tefillin, to pray for the integrity of the Land and its holiness, and in the afternoon to do the opposite of all that. This prayer book is not some magazine. I try to mean what I say.' 'Don't mix religion with the army,' he answered me. "'Maybe they put on tefillin and fast on Tisha B'Av, but they are not religious,' I answered. 'It is black and white: forbidden to carry out.' "
Moshe was sent to three weeks in prison under conditions difficult for an observant soldier. He was relieved of his command, stripped of his rank and compelled to release the IDF from his two-year contract. "I had the best contract of any company commander in the IDF," he recalled, "great salary, meals at home, company car, cellular phone, my own schedule. It was not simple to give all that up. But every man has lines he won’t cross and principles on which he lives, and he cannot throw them away because of a Toyota or an honor." Moshe says the army wanted to deal with him the way they did with so many other soldiers who refused to take part in the Disengagement – under the table, quietly. "I am the highest ranking standing army soldier who refused," he explained, "and besides, the show trial that is to take place is not meant for me, it is aimed at anyone who wears a kippa, at anyone who insists on 'mixing religion with the army.' "
Moshe, who became religiously observant later in life, is married and the father of a three-month-old daughter. He now works as a supervisor for a security company in the western Binyamin region. The decline in his quality of life due to the loss of his job as a ranking officer was drastic, but he does not regret a thing. "I am happy. There is nobody happier than me," he said. "The only decision I sometimes regret was not speaking with my soldiers and convincing them to refuse as well. I decided not to, because they were men with problems at home, with criminal files and the like, who the IDF was actively rehabilitating – I didn't want to be the cause of complications for them." Dimitri Pachnikov, married and a father of two, lives in Kiryat Gat. He worked for eight years as an investigator in the Ashkelon police. When the police began preparing for the expulsion, he was shaken to the core. The regional commander informed the police that any refusal would be met with unequivocal termination of his job as a police officer. "I understood that it would be difficult for me, and I didn't want to be in a situation where they would give me an order and then I would refuse. I could not see myself carrying out such orders and remaining a normal person. I thought about how I would be able to look at myself and how people would look at me." Dimitri requested to be dismissed on the day Gush Katif was first closed to enable the evacuation of the Maoz HaYam Hotel stronghold. When he saw his former co-workers taking part in dragging people from the hotel, he knew he had done the right thing. "I didn't regret it for a second – I was happy I wasn't there," he said. Interviewer Rotenberg asked whether it was his own decision or whether he was influenced by any rabbinic rulings. "I asked two rabbis, who both said it was forbidden for me to take part in the expulsion. That wasn't the deciding factor, though. I don't see it as a question of kashrut; even if the rabbis had ruled that it was permitted to fulfill the order, I would not have been able to do it." Most of Dimitri's friends from the police identified with his decision, but the financial need for their jobs outweighed their conscience. He received the most moral support from one of his commanders, whom he met on his way to Kfar Maimon. "He hugged me and said, 'I'm proud to be your commander.' " His wife also supported his decision all along the way, despite the fact that it has meant financial hardship for the family. Now Pachnekov has found only part-time work in a nearby kibbutz, relying on the Lev Yehudi organization - which provides help to those who refused to take part in the Disengagement - to make ends meet. Avidan Weitzman served for six years in the now-infamous Yassam riot police, becoming deputy commander of his unit. Avidan took part in a police conference prior to the Disengagement in which 3,000 police took part, including the country's most senior officers. "They told us they were bringing a rabbi to speak to us. When they called the rabbi to the podium, a guy with a three-foot ponytail got up and compared the conflict we would be taking part in against the settlers with the biblical mandate to make war against Amalek, saying it was just as critical. I sat there fuming; my hands were shaking. My commander grabbed my hand so I wouldn't get up and yell at him. Afterward, someone got up from the Israel Democracy Institute and presented a code of ethics, asking for participation from the audience. "I asked him, 'What must we do if obedience to the government violates the rights of the citizen?' There was a huge round of applause, with officers yelling out that the whole plan was illegal, and it simply destroyed the conference. Someone in the audience tried to explain that it was democratic, and one of the commanders said that Hitler was also elected democratically. The next day the regional commander came and declared that there would be absolutely no refusal, and that anyone who refused would be thrown out of the police." Avidan was unimpressed by the threats, and when his commander ordered him to pack up the crowd-dispersal equipment to be transported to Kfar Maimon, he replied that he wasn't planning on going anywhere. When they tried to convince him that it wasn't worth losing his job, he called his wife to consult with her, and then told them he stood by his decision. The next day he was fined 1,500 shekels and fired. "Almost all my friends at the police were lamenting the fact that they didn't have the courage to do the same thing," he said. Today he is taking a Labor Ministry course and living off of unemployment and help from Lev Yehudi. Though his financial situation is not good, he insists that he and his wife have never been happier. "You have crossed all the red lines," said the 12th Golani regiment commander to Elazar Sandorfi when he saw him among those on the fortified roof of Kfar Darom's synagogue on the day of the expulsion. Just weeks earlier, Elazar had been the deputy company commander in the same battalion, recognized as an outstanding soldier. He commanded the Kfar Darom region, but when the IDF was ordered to lay siege on protestors at Kfar Maimon, he refused orders and was compelled to dissolve his four-year contract with the IDF. "I lost my entire career," he said, "but I don't have one millimeter of regret. It was the right thing to do. Everyone needed to do his part in the struggle. Now they are trying to convince me to go back to the army, but I'll only go back once the army goes back to what it is supposed to be." Elazar, a resident of Nachliel, a settlement near Modi'in, still stands to be tried for his presence on the Kfar Darom rooftop. He is still angry about the IDF's role in the expulsion, and particularly the religious soldiers and the rabbis who legitimized their behavior in carrying it out. "We received an order to block the gate of Kfar Darom the day they evacuated the [Maoz HaYam] Hotel. A very large number of the soldiers heard the order, but continued to sit on the side, ignoring it. Suddenly I saw a rabbi show up, one of the heads of one of the IDF preparatory academies. He approached the soldiers and told them: 'Carry out the order!' "
Avidan Weitzman said the phenomenon of rabbinic support for soldiers 'just following orders' was one of the worst aspects of the expulsion. "This is something that is very difficult for the youth," he said. "On the one hand, they hear that it's totally forbidden, but then they ask about those rabbis who say yes to carry out the order - and I have no answer for them." Shaya Leib Gilo told Rotenberg that scores of religious officers and soldiers with whom he has spoken justified their participation in the expulsion, saying, "There are rabbis who say it is permitted." Elazar Sandorfi added that many soldiers he knew planned to wait until the day the order was given to refuse, but when the time came, they instead relied on the rulings of the rabbis from the pre-army academies to solve their ethical dilemma the easy way. "The youth were ready for anything and everything," Avidan said. "If they had been told unequivocally to refuse, they would have done so without question." Shaya Leib, from Maaleh Levona, was a platoon commander in the Duchifat battalion stationed outside Beit El. After he refused to go to Kfar Maimon, he was sent to prison and thrown out of his combat unit. He was assigned to janitorial work for the remainder of his army service and chose to leave early for psychological reasons. Leaving the army in such a manner has many negative effects on his civilian life, but he says he has no regrets. Moshe misses the IDF often. "I would like to return to serve in the reserves," he said. "There, it's a different mindset. On the other hand, it is hard to wear that uniform now." He recounted a number of his students at one of the religious military academies who returned from witnessing the expulsion and have since expressed their inability to wear the olive-green uniform and are considering not enlisting at all. "I tell them that they should enlist, but not agree to be rags and instead stick with their faith to the end. 'You are Jews with faith and there are things you simply don't do, even if they beat you,' I tell them. It needs to be clear to them that everyone is united on this matter, that there is a clear line that we are determined to stand by." Avidan and Dimitri express no interest in returning to the security forces until the IDF embraces "Jewish ethics" once again. At the time of the expulsion, each of the refusers was in a different place. "I was in jail," recalled Shaya Leib. "The prison commander forced us to watch the broadcast of the expulsion, saying it was an important event in the nation's history. It was very hard to watch. After I refused to take part, I regretted not having gone AWOL and joining them in Gush Katif. Everyone there in the prison watched and wept together." "I was on the roof there in Kfar Darom," recalled Elazar, "in a crazy conflict. The whole community recognized me, because I was in charge there. All the tools they used against me had been under my command the day before and now I was standing in the same place, but on the other side. I was faced with my own soldiers and the officer who replaced me, convincing them to refuse orders as well." "I felt completely betrayed by the State and the public," said Avidan. "My covenant with the state has ended. The symbols of the State of Israel no longer move me. I know that they are empty of content. I felt mourning, but a bit of happiness that I was not a part of them." Asked if their actions were for naught, and if they were disappointed that masses of soldiers didn't follow their lead, Avidan answered: "In a police bulletin after the expulsion, it said about 30% of police was absent from the force during the expulsion for health reasons. Do you think that so many police just happened to get sick during those five days?" "We wanted there to be a wave," Elazar said, "but even if I knew there wasn't going to be, I still would have done it. I have my path – the Torah, and to it I am obligated." With other high-profile refusers, such as Avi Bieber, recently breaking their silence, the expulsion objectors hope that their message will ensure that at least the religious public will learn the lessons of the Disengagement and will act differently next time. "The next stage is the destruction of Amona in Ofrah and the Shalhevet neighborhood in Hevron," Elazar told B'Sheva, adding that he hopes that soldiers will realize that they held it in their power to stop the destruction of Gaza and northern Samaria and hold the keys to the future of the Jewish people in the rest of the Land of Israel as well. Likud Chairman Binyamin Netanyahu's efforts to ban Moshe Feiglin from office would also affect former prisoners Dov Shilansky and Natan Sharansky if implemented. Michael Fuah, managing director of the Manhigut Yehudit (Jewish Leadership) faction within the Likud, published an open letter Wednesday, asking party chairman Binyamin Netanyahu to cease his efforts to classify those arrested for opposing the government on ideological grounds as criminals. Netanyahu has been spearheading a campaign to rid the Likud of "criminal" and "extreme" elements, submitting a proposal to the central committee that would ban anyone who served more than three months in prison from ever holding office in the party. Moshe Feiglin, who received 12.5% of the vote in the recent Likud primaries, was sentenced to six months in prison for the British Mandate-era crime of sedition after organizing mass civil-disobedience following the signing of the Oslo Accords. He was allowed to do the prison time in the form of public service, but the legal status of having served time remains the same. Feiglin was prevented from running for Knesset in the last elections because of a similar reason. Likud Elections Committee Chairman Judge Tzvi Cohen ruled, however, that Feiglin's crime is not considered one of "moral turpitude," and that therefore the disqualification was only temporary. Netanyahu's proposed addition to the party guidelines, would, however, permanently disqualify anyone who served more than three months in prison. While Fuah said that removing criminal elements from the Likud is a noble effort, the way Netanyahu is going about it is liable to remove outstanding members of the party such as the Tagar movement's Eli Sheetrit or former Knesset Speaker Dov Shilansky, who also served prison time for ideological reasons. "Valued members like Atty. Dov Shilansky, who was sentenced to 21 months in prison during the protests against accepting German Holocaust reparations, would not be able to serve in the party unless they receive permission from Likud judge Tzvi Cohen," Fuah wrote. "Former Minister Natan Sharansky and MK Yuli Edelstein, who were sentenced to long prison terms in the USSR as Prisoners of Zion, will also have to request a special dispensation from Cohen. This situation is intolerable and ridiculous. MK Michael Eitan's proposal that only those whose crimes were tainted by moral turpitude be excluded would have solved all these problems." "It is clear that the actions of Shilansky, Sharansky, Edelstein and Feiglin were not crimes of dishonor," Fuah wrote. "These ideologues are symbols of public struggles for which they paid a heavy personal price, but because of mistaken terminology, they have been classified as people unfit to represent the party without special permission from the head of the election committee." "Netanyahu's refusal to limit the disqualifications to those who committed dishonorable crimes is not practical," the letter continued, "and is also unethical from a Jewish perspective. The sweeping disqualifications reject the Jewish concept of teshuva, repentance." The Likud Central Committee is set to vote on Netanyahu's proposal this Sunday. So, how does a government manage to make people - people who owned large, spacious homes - grateful to receive the precious key to a trailer? To look forward with relief that they will soon be residents of a large trailer park? The real battle of the Maccabees was not only against the Syrian-Greek army of Antiochus. It was also against their fellow Jews, who were willing to sell out their identity, the Holy Temple and to allow Jerusalem to become a Greek city. All this in order to obtain for themselves "the good life" and to become "enlightened citizens of the world." "People mistake the sacred and the secular for adversaries at war with one another. But in truth, national life cannot exist unless both of these values are fully developed and channeled toward building the nation. Hence, we must endeavor to fuse them and imbue the secular with the holy." Experience the wide world of candy, chocolates, nuts and dried fruit at your fingertips - literally. Just click here. Pesach and Ski in Mont Tremblant. Chanuka Special!